Insects that feed or tunnel into wood can seriously damage houses, apartments, and other dwellings or structures. Each each year termites or other wood destroying insects damaged approximate 2 million homes. Depending on the extent or location of the infestation, fumigation is the only total control method proven to eliminate certain infestations of wood destroying insects. Because Vikane is a gas, prior to fumigation the structure is completely sealed. This serves to contain the Vikane in the building so it can penetrate wood thoroughly and eliminate the pests. Depending on the construction of the building, the doors and windows may be sealed with tape and a plastic sheet, or the structure may be covered with a tarp. The building remains sealed 4 – 72 hours depending on the specifics of the job. Warning signs are posted around the building notifying people to keep out. After the tarp and/or tape is removed, a professional fumigator will aerate the structure by opening the doors and windows. Fans may also be used to clear out the building. Once the dwelling has been thoroughly aerated, our fumigators will measure the level of any fumigant in the living space to ensure it is below the EPA approved concentration for reentry by the occupants. Extremely low levels of fumigant can remain for a short period of time in dead air spaces between walls and inside cabinets as well as porous materials suchas furniture. The small amount of gas in these areas will continue to dissipate for a few hours after the fumigation but at levels well below the establish safe re-entry concentration. Your building will not be cleared for re-occupancy until it is safe to enter. Our fumigators will post a notice on your building indicating the date and time for re-entry. Structures can be occupied only when the concentration is 5 parts per million or less (this represents a margin of safety – laboratory animals have been exposed to 100 parts per million for 2 weeks with no adverse effects.) Because Vikane is a true gas and not a vapor, aeration is rapid. Recent studies demonstrated that in most structural levels are less than 1 parts per million within 6 hours of clearing and have no detectable levels of Vikane within 24 hours after a start of aeration. Sulfuryl Fluoride is the colorless, odorless gas, that acts as a warning agent and is added to the building which causes watery eyes and a scratchy throat if entered during the fumigation. If you experience these symptoms in your home or facility after it has been recently fumigated, you should leave immediately and call us so we can have your building retested. Prior to the fumigation of your home or facility we will walk you through all the necessary steps specific to your home or facility that are needed. Below outlines the basic preparation needed for a fumigation. 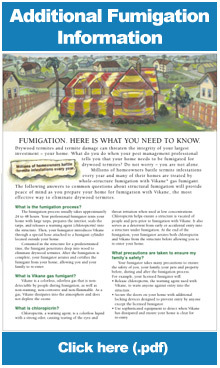 You can CLICK HERE to download a fumigation preparation sheet. 2.) All shrubs, bushed, and trees MUST be at least 2 feet away from the foundation of your home. All plants that will be covered by the tarp have a possibility of dying in the process of a fumigation. We recommend that you water heavy for several days prior to the fumigation if you have plants, bushes, or trees that you are unable to relocate. 3.) All consumables MUST be bagged with special fumigation bags. A preparation sheet will be given that outlines all things that need to be bagged prior to the fumigation. Give our office a call at 877.232.3055 and a state licensed inspector will come out and do a thorough inspection of your home or facility.